The San Rafael Swell trails offer unbelievable scenery, technical obstacles, fast washes and a great variety of terrain. This ride was an adventure to be remembered. We started our day early in order to make the 4 hour drive to the trail head situated just off the pavement at the turn off to Goblin Valley State Park. snow in the background not knowing we would return. We rolled in with little fuel to spare in the tow rig and unloaded the bikes. It was cool, but we soon warmed up as we headed North up Temple Wash towards the Orange Trail Head. By the time we stopped for lunch near the end of the Orange Trail we were shedding jackets to cool off with the warmth of the sun in the mid day. There was a little snow at this point, but most of this trail was dry and the going easy and fun! Upon completing the Orange Trail, we came to the Trail Head to the Red Trail. We quickly made the plan to head out the Red Trail in hopes of Looping back on the blue and running the Orange in reverse to get back to the truck. As we traveled North we noticed that all the North facing slopes were covered in snow, no problem, all the North facing slopes go down heading North, tenuous, but not too bad. A few miles into a trail that none of us had ever been on we realized we were running out of time. We had a couple hours of daylight, but the trail was difficult and the going slow. If we kept going we would run the risk of the unknown and could be caught out after dark with only one headlight between us and freezing temps. If we turned around we would have to tackle snow covered ledges, but we would be assured of escape knowing the route and knowing we could make it in time. 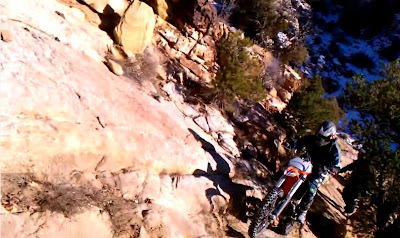 We turned around and battled the slick uphill ledges until we reached the top. At this point we decided to take the sure Route of the Blue and back to the road knowing there were a few snowy climbs on the orange to negotiate as well. The ride back to the truck was COLD with the dipping sun, sweaty from the work of hurling bikes up ledges, with the wind racing down the road to make it back to the truck. What a ride though! Can not wait to go back, preferably without snow! we decided to turn around and backtrack to the Blue Trail. Total mileage was 40 miles. Here's some bonus footage, for whatever reason I couldn't get the format to work with my editing software, enjoy!! Thanks Josh, it was a fun ride. I like the Swell alot. Other than the cold ride back on the road, the conditions were really good!